Interactive Brokers’ TWS platform now offers TipRanks fundamental analysis for US stocks, available through new tabs in the Analyst Ratings (Summary) and Analyst Ratings (Details) windows. Electronic trading firm Interactive Brokers Group, Inc. (NASDAQ:IBKR) keeps beefing up the capabilities of its proprietary TWS platform. 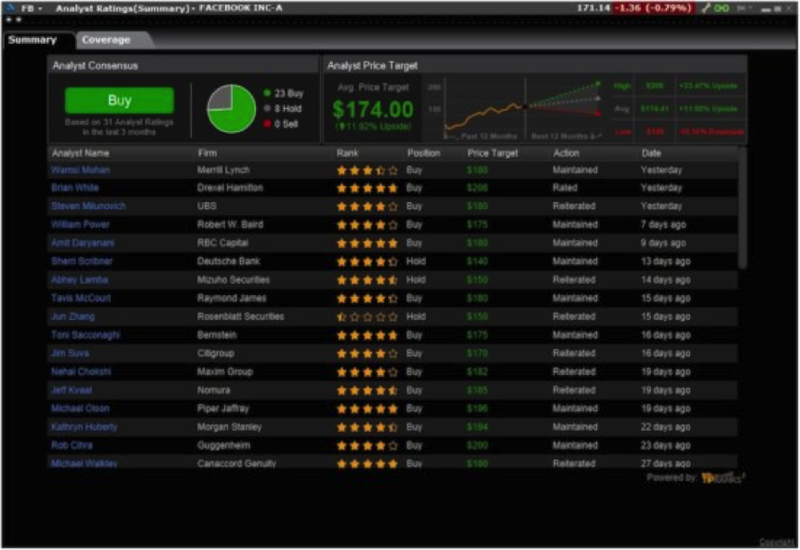 The latest (beta) version of the platform comes along with enhancements to fundamental data, as Interactive Brokers now offers TipRanks fundamental analysis for US stocks. TipRanks, founded in 2012, seeks to bring the general public accurate and accountable financial advice, provided by analysts, hedge fund managers, financial bloggers, and corporate insiders. The technology uses Natural Language Processing (NLP) algorithms to aggregate and analyze financial data online. TipRanks data is available on TWS through new tabs in the Analyst Ratings (Summary) and Analyst Ratings (Details) windows. To access these features, traders have to right-click a US stock and select Analytical Tools and then Company Fundamentals. Then, in the Fundamentals blade next to the stock symbol, they should use the drop down list to select the Analyst Ratings (Summary) or Analyst Ratings (Details) window. The Summary page now shows two tabs: Summary is the original view, and Coverage is the new Tip Ranks view. One can see the Analyst Consensus and its breakdown, the Analyst Price Target, and a list of analysts. The Details page also shows two tabs: the original view in the Details tab, and Tip Ranks data in the Price Targets & News tab. One can see the Analyst Price Target along with New Sentiment Score, which shows the ratio of Bullish to Bearish news in the past week. The other improvements to TWS are focused on the natural language solution IBot. The latest (beta) version of the TWS platform sees IBot get better in offering “Next Step” actions to traders. Traders are set to notice that the “Next Step” actions they are offered after a command become more and more useful to them. This is because IBot is now keeping track of the most popular “Next Step” actions, and as it learns it will offer these to traders at the top of the list to make their trading experience even more efficient.